Unique architectually designed modern bach/ family beach house with access to a reserve and the beach - no roads to cross - in the Southern /new/section/red shell end of Omaha. This house is ideally arranged for 1 or 2 families wanting a stress free and relaxing beach holiday away from the hustle and bustle of city life. With cold weather, there is an open fire and 3 heaters, plus electric blankets and wheat bags. Extra duvets in wardrobes. Open plan living is designed for entertaining internally or alfresco. Relax and enjoy all day sun with a choice of sheltered areas and decks opening from the living and dining areas - an open fire enhances the relaxing ambiance on those cooler evenings or chimera. There is ample extra parking for cars and boats. Omaha is perfect for bike-riding, walking, tennis, golf, fishing and of course, the beautiful white 4km sandy beach which is just a 1-2 minute flat stroll away. Paths lead from our quiet cul-de-sac to the beach, children's playground and tennis courts nearby. Along with the excellent white sand surf beach (patrolled in summer) there’s the sheltered estuary and boat ramp for all those water sports. Fishing, boating, kayaking, or windsurfing, it’s all here. And close by (7 minutes) are the superb environs of Matakana with its cinemas and shopping precinct and famous Saturday farmers' market, Leigh, Goat Island, Tawharanui Regional Park, not to mention numerous coffee shops and vineyards and much more. We supply duvets,tea towels, pillows. Great Bach for a family with kids - lots of toys, balls and a trampoline. Safe walk along paths to beach. Very spacious and modern with the bonus for the preschoolers of some toys. 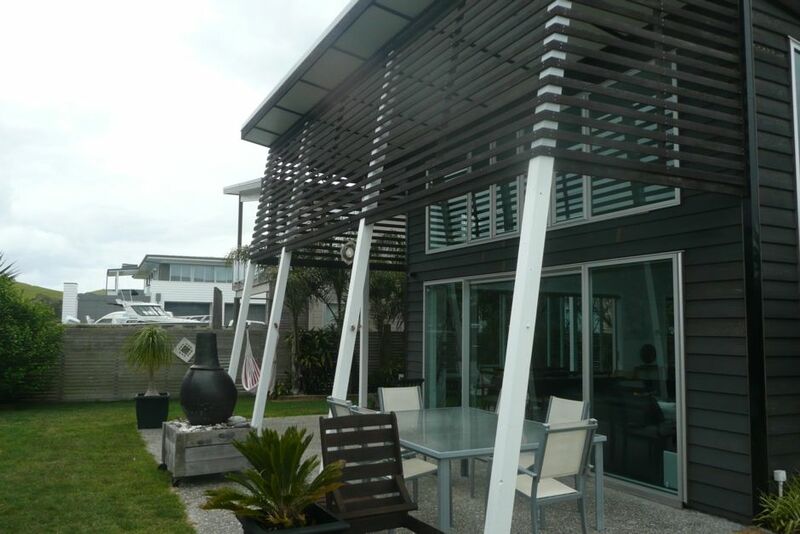 Close to the beach and an excellent outdoor space completely fenced for child safety.A very good property for our family weekend. Thank you and glad you enjoyed our place. You were a pleasure to deal with and left the house in amazing conditioning. Would rent to you again. Thank you. We had a great time in a well located large and well laid out home. The house provided all the space we needed. The older kids in the bunks in the garage and the separate lounge area upstairs for them was perfect. We made good use of the tramp and chimnea too. Great location and straight out to the beach walkway. The house is a well used home so maybe a bit too much stuff around but for us that felt great. Loved it. Clean and perfect for familys holiday house, 2 minutes walk to beach, lots of toys and entertainment for kid, will visit next year again. Light and spacious beach house. We thoroughly enjoyed our stay. Bunk room in garage was a surprise.